St. Joseph's College is independent and coeducational. The College was founded in 1916 by the Congregation of the Sisters of St. Joseph. *SJC Online enrollment figures are included in SJC Long Island totals. SJC has ranked well among U.S. News & World Report, Forbes, Washington Monthly, Money Magazine, Military Magazine, and more. *SJC tuition is $8,600 less than the average cost of other private four-year colleges in the United States (Trends in College Pricing 2018). Online programs offer a reduced tuition rate. 82 percent of our students receive financial aid. More than 50 undergraduate majors, pre-professional and certificate programs, with graduate degrees in management, business, health care management, human services, nursing, accounting and education. Service has been at the core of a St. Joseph’s College education for over 100 years. Each year, students, faculty and staff from SJC Brooklyn and SJC Long Island participate in hundreds of local, national and global community service and service-learning projects. 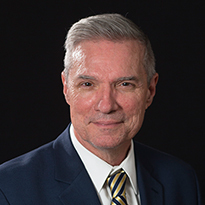 48 NCAA tournament appearances; 42 Skyline Conference championships; six-time Skyline President Cup winners. 865 Skyline Conference Academic Award winners (last five years; GPA over 3.3); 21 Skyline Conference Scholar Athletes of the Year (highest GPA in Conference for all sports). Three All-Americans; Two Academic All-Americans. Collective Athletic Department GPA: 3.32. St. Joseph’s location in Brooklyn puts it at the center of one of the nation’s most diverse academic and cultural cities. The Brooklyn Academy of Music, the Brooklyn Public Library and the Brooklyn Museum of Art are all just minutes away from its doors. 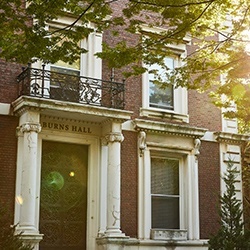 In contrast to the College’s historic brownstones, its library, McEntegart Hall, was named by New York state's education commissioner as an Electronic Doorway Library. The Dillon Child Study Center, a teaching facility for St. Joseph’s child study majors and a preschool for members of the community, was one of the first of its kind on the East Coast. Named after the College’s sixth president, S. Elizabeth A. Hill, C.S.J., J.D., the 40,000 square-foot Hill Center features a 270-seat, NCAA-regulation basketball and volleyball court, conference rooms, a dance studio, an outdoor terrace overlooking Vanderbilt Avenue, a fully-equipped sports medicine suite and a 90-car underground parking garage. SJC Long Island is in Patchogue at 155 W. Roe Blvd., directly off Sunrise Highway. Well situated on the South Shore of eastern Long Island, SJC Long Island is just minutes from the Great South Bay, Long Island MacArthur Airport, Brookhaven National Laboratory, Orient Point and many of Long Island’s ocean beaches. New York City is just a short ride away, via the Long Island Rail Road. The John A. Danzi Athletic Center boasts an elevated track, six-lane pool, weight room, fitness center and NCAA regulation basketball court that can seat 1,500. 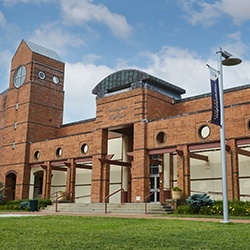 The $8 million, 33,000-square-foot Business Technology Center opened, housing classrooms, computer labs and faculty offices.